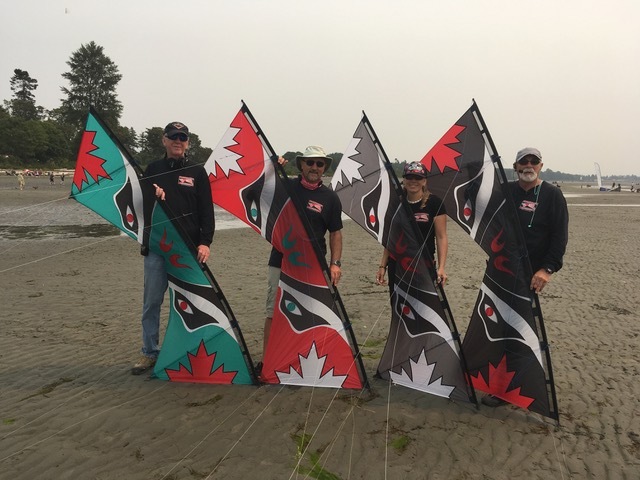 I love all kites, but team flying a quad-line is what really gets me excited! Wakesurfing, kiteflying, gardening, beachcombing, weightlifting. I'm digging the blue one! Hey! Awesome! Way to go, Mom! Ah, yes. I know what you mean. I did melt them a little with a lighter, but not as much as you suggest. I like that idea, and I'll do that tonight. I have not tried painting the line between the knots. I paint it so thick with several coats that I'm pretty sure it would crack and peel off. I'm a fan of the Bose products, that's for sure! But my painted knots are pretty amazing too, right? Thanks for your reply, but... I paint the knots the colors of the rainbow because then they match my rainbow kite. What can I say? I like pretty stuff! It also eliminates the chance of flying on two different knots by accident (yes, I have totally done that!). This way, I just larkshead to red, or green, etc. I just painted a couple of new sets of leaders over the weekend... I'll upload a photo. YES! I love this! I'm definitely going to use a clove hitch! Thanks for the great idea! Thank so very much for all the replies, you guys! And not to worry, I'll be extra careful around the burrs. You mean short little pigtails to attach my leaders to, instead of attaching my leaders directly over the screw, right? This is something I already do. Mostly because I spend a lot of time painting each knot with nail polish, and so now when I get a break, I simply remove the broken pigtail, add a new one, re-attach my leaders, and I'm good to go without having to paint another set of leaders. Make sense? Lots of great tips & tricks here, you guys! Before i get started on mine, any new tips or discoveries since the last post? Thanks in advance! Wow! This is incredible!!! Not a bad choice of music either, don't you think Katrina, Carol and Cass?